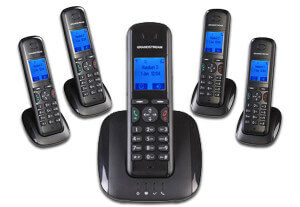 Grandstream DP715 is the ideal and most convenient handset used for offices as well as for the personal use. It is a VoIP DECT handset that includes a base station as well. The base station of this DECT handset also supports an additional 4 headsets of DP710 which means there will be a total of 5 handsets and the base station will provide you with a maximum of 4 simultaneous calls at the moment. Grandstream DP715 comes with a very simple and easy user interface. It can be called as the next generation handset in terms of the latest technology and outstanding features that it possesses. You can find DECT cordless IP headset Grandstream DP715 easily in Dubai, UAE, Abu Dhabi, Sharjah, Ajman, Umm Al Quwain, Ras Al Khaimah & Al Ain. The compact size and the high audio quality of Grandstream DP715 combined with a wide range of features provides you with such captivating performance that takes it to the leader of the market and all this comes at a very affordable price that is just simply better than anything else. It supports a range of 150 feet indoor and 1000 feet outdoor (depending upon the blocking structures) radio coverage. Thus, at a cheap price, you can enjoy several benefits that include mobility and VOIP. The headset is compliant with the standards of DECT and SIP and the field proven for flexible deployments. It provides you with an 80 hours of standby and a talk time of 10 hours. So, if you want to increase the quality of your communication experience, then the best way to do so is by getting a Grandstream DP715. The Grandstream DP715 is a phone with complex features used for offices as well as for personal use. This phone is best for the users in a manner that it inexpensive at the same time it is reliable. It is a DECT phone that comes with many features. At the base of DP715, approximately five cordless handsets can be added. It has some additional features that were not present in previous versions of DP71X. It is affordable VoIP solution for business and residential use. It has an excellent voice quality and performance. It has a wide area coverage that enables its users to increase the power of IP voice application. Many advanced features include caller ID detection, call waiting service, message waiting indication auto talk feature and many others. It is very simple, and it can be installed quickly. Another feature is that it is a very secure system that provides provisioning. It comes with a lot of safety features. Warranty for damage and repair is also provided along with the device if a user buys it from the reseller. It is compatible with SIP industry standard so it can be used with many SIP devices and software. It supports many voice codecs like G.771, ILBC and others. Some additional features like the disabling call-waiting tone that allows the user to enable or disable call waiting tone. RFC 3261 can be configured using an additional options SIP Timer D.
The user can configure the sip register contact head uses to LAN or WAN address. Caller ID display option is available. Timer configuration using option reregister before expiration. Some additional options are available such as use privacy header that can be either physically challenged or enabled by the user. Similarly small changes from 1.0.0.21, 1.0.0.8 and 1.0.0.5 user manuals are made in this updated version. Comes with a DECT base station with one handset. After connecting the router with Ethernet cable, connect the phone to DP715. Devices completely power up after plugging the supplied cable into the DP715. After this user must pick up phone and dial ***. After hearing menu dial, 0 2 and user will get a message of his/her IP address of DP715, which must be saved. After entering the IP in the web browser, enter the password. It requires configuring server settings for user’s Callcentric account. Detailed information, to be filled in is provided in the manual. After step 4 user needs to click the update button. After tis reboot, the system and device will be registered completely for a Callcentric account. After this step configuration is completed and the user can now make the phone call. To transfer a call each time ATA star codes are required. There is one SIP Registration for each handset. You can visit different websites online that shall tell you about the reviews of different people about the Grandstream DP715 Dubai. From the reviews, you shall get an idea about different drawbacks or positive points that shall help you in making your decision.